Adrenal fatigue – also known as the stress syndrome – is a condition believed to be caused by poorly functioning adrenal glands. The push and pull, high-stress, little free time, and the sense of urgency we face day to day has the ability to tear us down, and it can wear on our adrenal glands. These glands are responsible for hormone production, and they help us respond accordingly to stress (i.e. to cope). In an ideal world, these hormones are happy and healthy and regulated – not too much and not too little. Alas, when our hormone producing adrenals are “fatigued,” they function much like we do when we’re sleep deprived and exhausted: inefficiently. If you have a hunch that your adrenal glands might be suffering, and you want to address the issue, it’s always wise to see your primary health care practitioner, a functional medicine practitioner or a naturopath to get an accurate diagnosis. When it comes to treatment, fortunately, this lifestyle induced condition has a lifestyle cure, and many people believe in taking a holistic approach to healing. 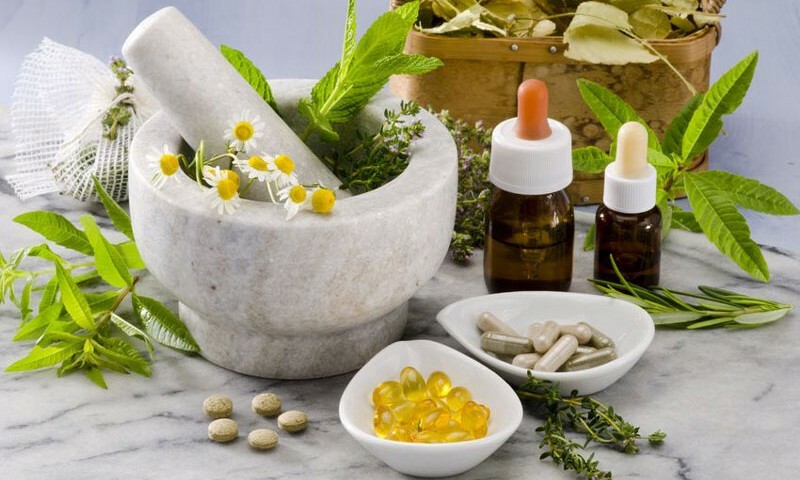 The natural supplements and nutrients listed below all have health benefits that support adrenal health, and play an important role in recovery from adrenal related fatigue and other stress symptoms. You can read more about the symptoms of adrenal fatigue here. Adrenal fatigue stems from stress, so cortisol plays a huge part in both diagnosis and recovery. Cortisol is the stress hormone, and the more of it our bodies use, the more vitamin C – or ascorbic acid – we need! Vitamin C actually acts as an antioxidant in the adrenal cortex, so it’s incredibly important to the functioning of the adrenals overall. Of course, vitamin C is most widely known for immune support (which can be compromised by adrenal fatigue), so you’ll double up by fighting off one of the most pressing symptoms of adrenal fatigue: increased sick days and longer recovery time. Use more vitamin C than you would normally, if you’re under moderate-severe stress (the adrenals need it!). Don’t limit yourself to citrus. Other food sources of vitamin C include dark, leafy greens, tomatoes, bell peppers, and papaya. Try lemon juice in hot water in the morning versus a sugar-loaded glass of orange juice which wreaks havoc on blood glucose levels. Use vitamin C supplements with bioflavonoids and nutrients like magnesium to increase bioavailability. Remember: vitamin C is water-soluble. This essentially means that it passes right through you, so supplementation can happen over the course of the day for someone with adrenal fatigue. The reason why vitamin E is important is because of its enzymatic reactions. Vitamin E lessens the damage of free radicals in the adrenals (the job of antioxidants). It works in conjunction with vitamin C to support recovery; vitamin C gives ‘energy’ to vitamin E by increasing its cellular activity and ability to take down those pesky free radicals. Because of its uncanny free radical-fighting abilities, vitamin E is also known for anti-aging benefits and healthy, supple skin due to less oxidative stress in the body. Take around 800 IU of a mixed tocopherols vitamin E supplement per day. You can expect to see the benefits of supplementation in around three months, so patience is required alongside dosage. Consume vitamin E supplements with meals because it is a fat-soluble vitamin, and it needs fat to be absorbed by the body. Food sources of vitamin E include almonds, spinach, pumpkin seeds, sweet potato and avocado. 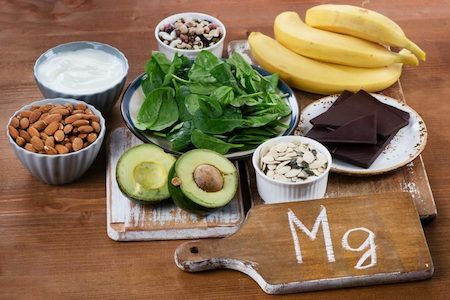 Did you know many people are deficient in magnesium? This important mineral is one of the most crucial for a night of good sleep and adrenal fatigue recovery alike; it has a lot to do with energy flow in our cells. Magnesium can be especially helpful for those of you who feel like you’re under a significant amount of stress and are maybe in the beginning stages of adrenal fatigue, because it can be useful as a preventative measure. Increase magnesium intake along with vitamin C intake during times of intense distress. Magnesium has an increased absorption rate at night. Ideally, you would take around 400 mg. of a magnesium citrate supplement (important detail!) near 8 or 9 p.m. before bed. If stress is increased, you can increase to 2-4 doses per day. Food sources of magnesium include kelp (a type of seaweed), fish, yoghurt and dark, leafy greens. Dark chocolate and coffee are also good sources, but it’s best to avoid caffeine while recovering from adrenal related issues. B vitamins cover a broad range of specific adrenal concerns. Pantothenic acid – a B-complex vitamin – is needed like magnesium for energy maintenance and production. Moreover, it works well – and is even necessary – in conjunction with the three supplements we’ve already mentioned! Seek a B-complex vitamin that contains more niacin than any other B vitamins. Otherwise, it’s good to take a separate niacin supplement to support enzymatic reaction within the adrenals – an important function when considering supplements. Generally recommended adrenal support B-vitamin dosages are as follows. Remember: these levels are individual, so please use your best judgment or work in conjunction with a naturopath or another trusted medical professional. 50-100 mg. vitamin B6, 75-125 mg. B3, 200-400 mcg. B12, 25-50 mg. niacin, 1,500 mg. pantothenic acid. Avoid “stress formula” vitamin B supplements as they are not easily absorbed or metabolised for the body. Food sources of B-complex include beef or chicken liver, fish, chicken and eggs. These foods all include a variety of B-vitamins rather than being an isolated source of just one, so you should be packing in the (quality) protein! Fermented cod liver oil is a rich source of omega-3 fatty acids. The connection to adrenal fatigue? Often, the standard Western diet means our bodies contain an unbalanced ratio of omega-6s to omega-3s. This means inflammation spikes in the body, and the adrenals are responsible for managing that! By ensuring that we’re getting quality omega-3 fatty acids into our diet – and a little vitamin D doesn’t hurt – FCLO can help you to take some of the workload off the adrenals. Be sure to supplement with fermented cod liver oil as the fermentation process makes its benefits more readily accessible to the body. Purchase products only sold in dark coloured bottles (like the ones photographed above) so the product is as potent as possible. To obtain enough omega-3 fatty acids in food, try including wild-caught seafood like salmon and sardines in your diet 3+ times per week. This ‘ancient’ medicine called ashwagandha is something we’re fans of here at Happy Body Formula, and we’re big believers in its adaptogenic properties – especially the way it impacts the body’s resilience to stress! Since stress and the hormones released in its presence play an obvious role in the eventual diagnosis of adrenal inefficiency, addressing stress levels is often one of the first steps in recovery. Adrenal fatigue can be recovered from if you’re focused on lifestyle ‘cures,’ and using ashwagandha has been proven to reduce stress levels and increase quality of life. This study also shows that it possesses the ability to reduce cortisol levels in the adrenals. A daily 500 mg. dose of ashwagandha reduced cortisol levels in participants by around 30%. Warning: 35 grams or more of ashwagandha per day can be detrimental to recovery, and you might experience a decline in adrenal function. You can purchase ashwagandha in powder form at your local co-op, health foods store (often found in the bulk foods section) or online. This herb is one of the most powerful natural stress remedies, so without question, it is highly welcomed by the adrenals! Licorice is known to strengthen cortisol levels which helps this root get to the ‘root’ of things. It also helps to address additional complications we might see due to adrenal fatigue like inflammation, a weakened immune system, nervous stomach, and hypoglycaemia. Avoid eating candy. Sugar is one of the primary culprits in the worsening of adrenal fatigue, and a refined sugar-free diet should be used in any proper treatment plan that you consider. One of the easiest ways to supplement with licorice root is to drink the tea of it. You can add a little honey to replicate that ‘candy’ flavor the au natural way. If you find licorice roots in their natural form (as they are pictured above), you can actually chew on the woody stick (don’t swallow!) to reap the benefits. If you’re avoiding salt, fat and whatever else the food industry has deemed ‘bad’ for you but you’re feeling rather low with adrenal fatigue symptoms, it may just be part of the problem. We talked a bit about fatty acid balance above, but where does salt come in? For one: it’s not necessarily the truth, and two: it could actually be good for you. Salt is about a balance; there is no proper dose, nor should you consume excessive amounts of it. A real food diet benefits from additional salt, whereas a diet full of refined oils and/or carbohydrates with processed foods (with high-sodium levels) will not, and neither will adrenal fatigue symptoms. Choose from the healthiest salts including sea salt. Bonus: mix it with kelp granules to up the nutrient content and umami. Considering the focus on a real food diet, we want to move away from refined carbohydrates and oils and place the emphasis on quality animal proteins and fibrous, green, nutrient-dense veggies. One of the main problems is the way that protein irritates many people’s stomachs because adrenal fatigue is often associated with low levels of hydrochloric acid. The way to address this is with digestive enzymes, which can help the body produce more HCL and an increased ability to tolerate protein breakdown and healthy digestion. Digestive enzymes also increase bioavailability of nutrients, helping you to reap the benefits of any other supplements you might be taking. Digestive enzymes should naturally be taken prior to eating a meal that you anticipate causing you digestive distress. One of the primary drivers of the continuous and relentless cycle of adrenal fatigue is caffeine and overconsumption of it. We’re afraid to ‘crash’ harder than we already are each day, so we keep sipping cup after cup of coffee late into the day! If you think adrenal fatigue sounds familiar, we suggest cutting out caffeine entirely or switching over to green tea if you continue using caffeine at all. It has antioxidants and plenty of well-known anti-cancer benefits. It’s a great alternative if you are avoiding the mess of going through caffeine withdrawal but still need a ‘healthy’ boost. Ditch coffee for green tea or herbal tea entirely. Don’t overdo the green tea! Limit caffeine intake to the mornings and to one or two cups so that it doesn’t interfere with sleep; sleep is vital to adrenal fatigue recovery.